Batwa Trail is a thrilling community based tour product organized by the Batwa community living near Bwindi in partnership with the Uganda Wildlife Authority and Non-Governmental organization -Pearls of Uganda. The trail is developed to help local communities to gain income from tourism activities which take place in their traditional land and also offer unique chance to visitors on Uganda gorilla safaris to explore the unique culture of the disappearing yet interesting Batwa local community. The highly rewarding trial starts at the base of the splendid Mt Muhavura at 8.00 am and it takes visitors on Uganda safaris to this part of Uganda across the lower slopes of the Muhavura and Gahinga volcanoes situated in the smallest but highly endowed Mgahinga Gorilla National Park in Uganda. The Mgahinga forest is home to various unique species of wildlife but the Batwa Trail is far from being an ordinary nature walk. With the assistance of Batwa guides, visitors on gorilla trekking safari to Uganda will get an added opportunity to under the forest as a larder, pharmacy, tool kit, builder’s yard and, above all a natural home to the Batwa local people. 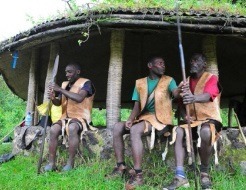 Along the trail, one will be exposed on how to fire a bow and arrow, visit bee hives for wild honey and also assist reconstruct a Batwa shelter, partake in harvesting plants for medicinal and consumption purposes, learn how to set a fire without a matches as well as learning about Batwa traditions especially when the legend is explaining. The outstanding bit of the trail is when visitors on Uganda gorilla tour but exploring the trail descent into the Garama cave, which is 200m-long lava tube underneath Mt. Gahinga. The Batwa are well-known for their musical and dramatic dance performances and these are offered in the subterranean council chamber in Garama Cave. The Batwa trail is an observance of the forest culture of the Batwa who were the first people to live in the forest before they were evicted to give room for mountain gorilla park conservation. It is therefore recommendable that all travellers on Uganda gorilla safaris to Mgahinga or Bwindi spare some time to explore the Batwa trail.